Few New Yorkers would know that Hasidic Jews developed the East Village. They wouldn't know this, because it isn't true. But this is what a guide from one of those "hop-on, hop-off" red double-decker buses told us, and it wasn't all the guides got wrong. New York Apple Tours, the largest operators of those buses, has been in the news lately for its string of safety violations, the May 23 accident that killed a pedestrian, and the $800,000 fine it was assessed July 28 after pleading guilty to making false statements to avoid meeting federal emission standards for about 70 buses it imported from England. "It's mind-boggling why this company has been allowed to operate," said City Council Member Christine Quinn (D-Manhattan) after the city tried in June to shut down the company. Besides its safety record, though, the company also cares little about training guides nor making sure they don't spout misinformation. Neither, it seems, does the city. Though the city Department of Consumer Affairs now licenses 1,248 tour guides, veterans say the city does little to ensure guide quality, nor does it fully enforce existing regulations. The licensing test "is a joke," said Manfred Marko, an official with the Guides Association of New York City, a nonprofit group organized in 1974, which now includes some 215 professional guides. "In other countries, there's extensive schooling for guides. Here, people come from abroad and after a few weeks" pass the test. MR. SMITH GOES TO NEW YORK CITY? I was on a New York Apple Tours bus last year after I had gotten my tour guide license and applied for a job (and though I was told I passed muster, I was never actually called). They had interviewed me for three minutes and then sent me on the bus for the day to observe. It's hardly an easy job, taking tickets, keeping tourists from getting decapitated (if they stand under low-lying trees), and working with lurching, rickety buses and balky public address systems. And certainly not all the guides I observed were lousy. But the worst were cheerfully ignorant. Besides getting the East Village confused with Brooklyn (where Hasidic Jews actually have settled in several neighborhoods), they characterized Little Italy as having a large Italian population (without mentioning that, actually, Chinese people have largely replaced the Italians), and said that Soho was very similar to Greenwich Village, without even mentioning the cast-iron buildings for which Soho is distinguished. It should not have surprised me when I saw in one of the company's scripts the following tidbit: the International Center of Photography was "started by Robert Capa, brother of the famous photographer Frank Capa"? Actually, the International Center of Photography was founded by Cornell Capa, brother of the famous photographer Robert Capa. Frank CAPRA, with an "r" in his name, is the film maker who directed "It's a Wonderful Life" and "Mr. Smith Goes to Washington." A former employee told me that Apple guides were basically unsupervised. Timothy "Speed" Levitch of The Cruise began at Apple Tours and, like many others, moved on to the better-paying, more respectable Gray Line and then to more lucrative private tour gigs. Looking back, Levitch calls Apple Tours his "first introduction to New York capitalism," saying the company treats tourists like "cadavers," with guides' main aim to keep them from demanding refunds. 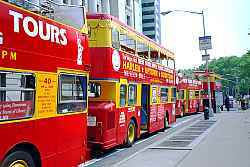 Misguided or not, these tour buses are popular, and some people consider them a crucial part of the tourist industry. In a ruling June 14 staying city and state efforts to shut down New York Apple Tours, Manhattan Supreme Court Justice Phyllis Gangel-Jacob declared that "Tourists hear about New York City and sing about New York City but they naturally hesitate to venture forth alone and unguided." As part of the litigation, the judge approved a plan in which Apple Tours hired a monitor to improve driver training and ensure bus safety. But she said nothing about guide quality. Most tourists, of course, don't know any better � nor do they vote, which is probably why the Department of Consumer Affairs focuses on closer-to-constituent issues like the price of video rentals. The Department of Consumer Affairs' licensing test, however flawed, isn't easy, and you'd think it would weed out the ignorant. It has gone through three or four versions in the past-quarter century. "The test is significantly more rigorous than the previous test, three or four years ago," observed Seth Kamil of Big Onion Walking Tours which is known for having guides with academic training in history. "But what's the point?" The test may turn out tour guides who can "play traffic cop/director," he said, "but for people to understand the fabric of the city or individual neighborhoods, this test doesn't do anything." Indeed, to become an official Sightseeing Guide, you must go to the offices of the city's Department of Consumer Affairs and, within two hours, pass a multiple-choice exam with at least 100 out of 154 questions correct. Consumer Affairs advises prospective guides to study the Michelin Guide and the Encyclopedia of New York City in order to prepare. The test is heavy on architecture, museums, bridges, and history. While a good number of the questions were legitimate (Q: Which museum would you find Edward Hopper paintings? A: The Whitney Museum of American Art), some were, if not totally obscure, dubiously relevant (Q: In what neighborhood did Yankees star Lou Gehrig live? A: The Encyclopedia of New York says he was born in Yorkville and later lived in Fieldston). The city's ethnic diversity was mostly ignored. There was one question about Chinatown and two about Harlem. There were no questions about gay New York. There was little about the outer boroughs. Of course, the license says Sightseeing Guide, and the test seems geared not so much to savvy ambassadors as guides basically qualified to work at New York Apple Tours and Gray Line. That must be why five questions concerned legalities of where buses could idle or park. I asked the city's Department of Consumer Affairs for information on the philosophy behind the licensing test, but I couldn't get much from spokeswoman Deborah Wetzel. She said such information could compromise the "security" of the test. And what, lead to even less qualified guides? Not every place is indifferent. Some companies, like Big Onion, or sponsoring institutions, like the Museum of the City of New York or the 92nd Street Y, try to emphasize the quality of the guides. Tourists who do some homework can find a plethora of tours via boat, helicopter, bus, or on foot, though sorting them out isn't always easy. But to improve the system in general, and provide an extra tier of expertise, some of the professional tour guides would like to see a program of certification, not unlike the Blue Badge guides in the United Kingdom, who undergo extensive training. Charleston has a Tourism Commission, something New York City lacks. The city's Convention and Visitors Bureau, NYC & Company, is designed to promote tourism, not to enforce professional standards. Veteran guides think there should also be a city agency, akin perhaps to the Mayor's Office of Film, Theatre, and Broadcasting. Such an agency would not just enforce standards but coordinate the regulatory functions now parceled out among Consumer Affairs, Transportation, Police and others. Meetings at NYC & Company have been convened recently to coordinate the movement of tour buses (not just double-decker ones), admittedly a pressing problem. But those meetings should lead eventually to a discussion of the quality of the guides. Tourism in New York City isn't just a $16.4 billion industry. It is a way New Yorkers create an image of our city for the world, and for ourselves. It would be good to get the picture right. Norman Oder is a journalist and tour guide .